Special Offer Details: Special offers can be withdrawn at anytime by the tour operator. To avoid disapointment and guarantee your FREE Speedboat Trip BOOK ONLINE now. Transport Type: Van transport to/from ferry terminal. Quad bike during tour. Additional Information: If there are two in your party and one of you does not want to drive the quad bike, you can travel as a passenger. Drivers must be over 21 years of age and hold a full driving license which is required at the start of the tour. Both driver and passenger are insured however drivers are liable to pay €330.00 for any damages which are self caused. The speedboat via Comino Caves to return back to Malta operates subject to suitable weather conditions. In the event that the weather is not suitable you will return back to Malta by ferry. You will be picked by regular transport for a transfer to the Gozo ferry terminal. The short crossing to Gozo takes 25 min en route passing the island of Comino. 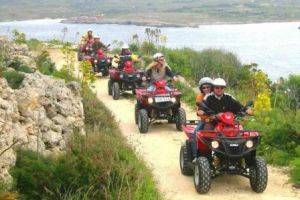 On arrival in Gozo you will meet the Quad Bike tour leader. 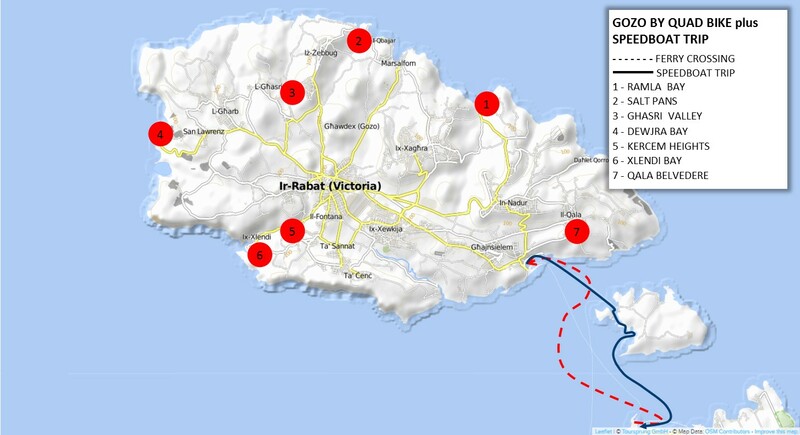 Simar Valley, Qala Belvedere, Ramla Bay (time for a swim during summner), Marsalforn, Saltpans, Ghasri Valley, Dwejra Bay (Inland Sea, Fungus Rock & Blue Hole), Limestone Quarries, Kercem Heights, Xlendi Bay and Sannap Cliffs. Really good enjoyable day. Good lunch, a nice surprise as we only expected a sandwich!